When it comes to street food, chat bhandar on the road sides is the place that is much sort after in Hyderabad. Apart from usual stuff we have separate outlet for Mirchi hajji, and cut mirchi. I did not get chance to try the street food in Chennai or anywhere in TN. 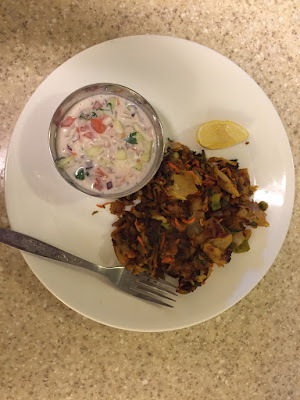 I have tasted South Indian food in hotels especially tiffin items in Chennai, but never had a chance to taste kothu parota. I only know the name of that dish. Not even watched in any cookery show. Yesterday was the first time I browsed for the recipe, when my daughter told we should try to make it, as she has tasted in Saravana Bhavan and liked it very much. It gives pleasure cooking during holidays leisurely when all the family members relish special menu. Though deciding the menu is not an easy job, it will be nice if we try a new item together in the kitchen. The outcome of such trial was today's menu. I followed two bloggers' recipes. Aarthi's (yummy tummy) for Malabar parota and Rak's kitchen for kothu parota. Kothu parota recipes called for store bought paratas. I thought of trying paratas at home. Strictly followed aarthi's recipe and could successfully make 6 parotas. 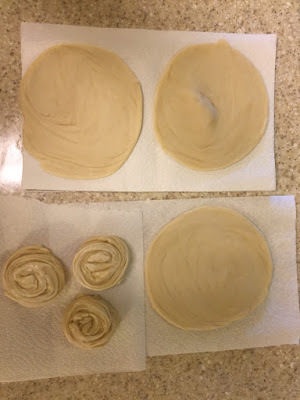 Since preparing parotas consumed more time(preparing dough and allowing resting time) I decided to follow recipe from rak's kitchen blog, which had no salna preparation. I used tomatoes and followed the recipe as given by her. Thanks to Aarthi and Rajyalakshmi for a nice post. The Marothon effort started here. To have this for lunch, I started the preparation at 7am. It tasted good and was sufficient for four adults. I did not miss Saravana Bhavan. Take flour in a bowl . Cover the dough with wet cloth and leave for 3 to 4 hrs. After 4 hrs knead the dough using flour if required. And make equal 6 portion of dough. Roll each ball into thin rotis. Apply the maida oil paste on the roti. 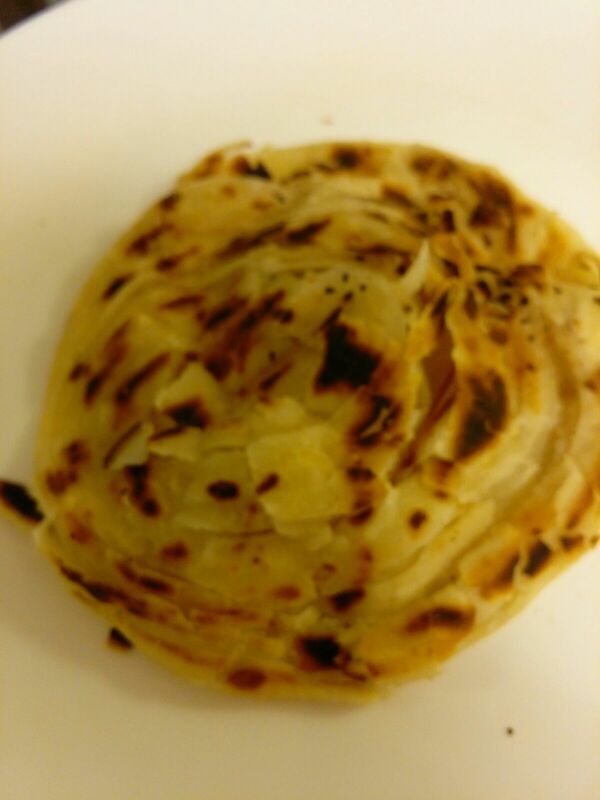 Cut the roti into thin strip. Place one above the other and roll into a spiral shape flat dough and keep aside all the six portions covered with wet cloth again for 1/2 hour. After half an hour, make thick rotis. 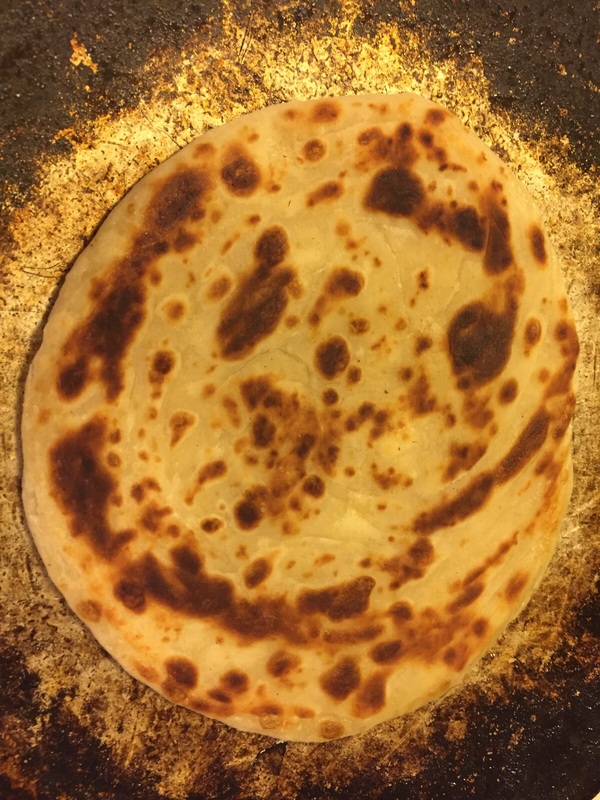 On hot tavva, use oil and make roti turning both sides. Cut the parota into small pieces and keep ready. 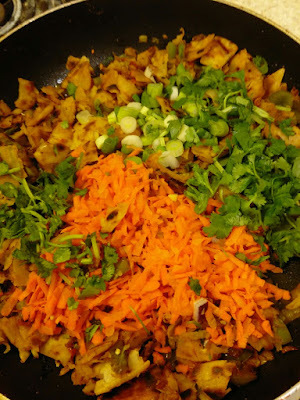 This is the link for kothu parota. 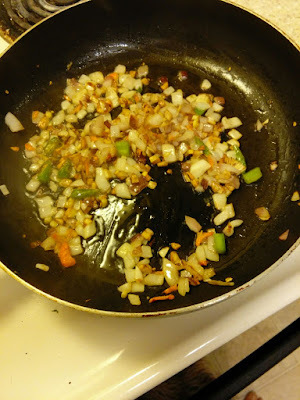 Add garlic pieces and saute. 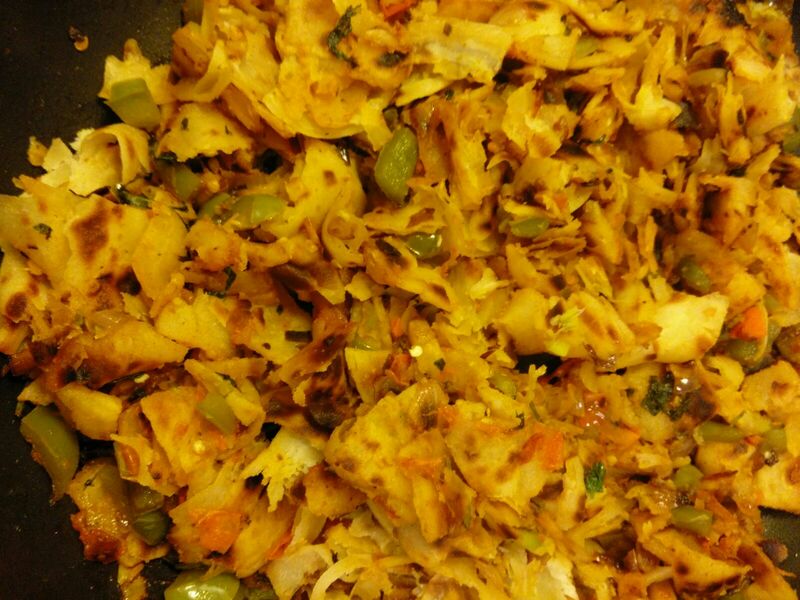 Then add onion (finely chopped) followed by green chilli, and ginger pieces and little salt. 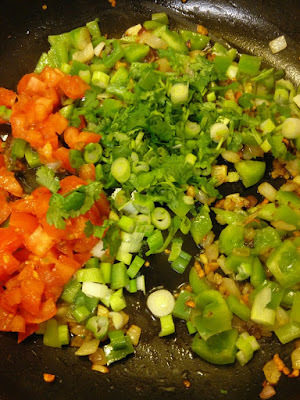 Add cubes of capsicum and saute. Add tomato pieces and saute. 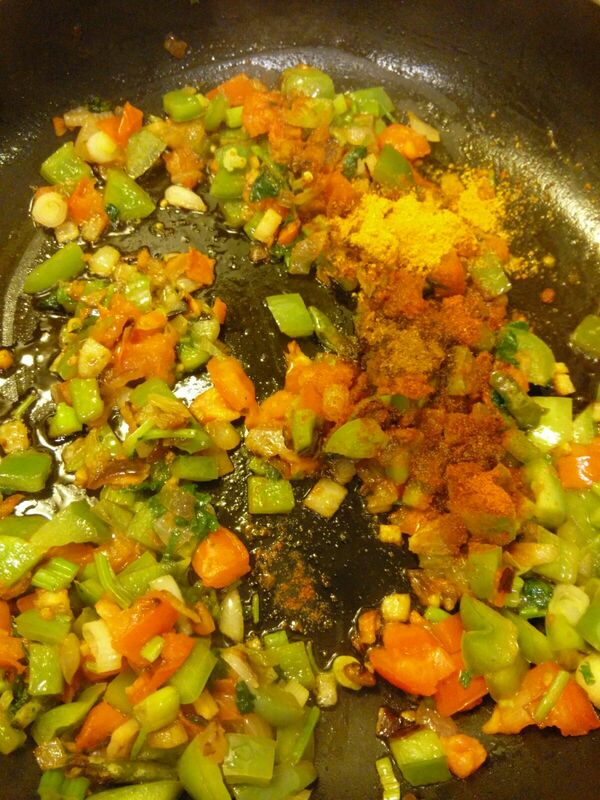 Mix well and add the parota pieces. Finally add grated carrot, spring onion and coriander leaves. Give a good stir so that all the pieces get coated well with vegetable and spices. Enjoy street food at home.Serve hot with raita.